Yanawana is passionate about free/affordable and accessible healthcare for all. We also firmly believe that access should include holistic modalities. Our healthcare clinics integrate multiple modalities whenever possible in order to bring our clients an integrative heatlh experience designed to compassionately and holistically address their personal healthcare needs. These services are free to the community, and integral to improving health outcomes in the communities we serve. Beginning in May 2019, Yanawana Herbolarios will be offering free monthly botanical integrative healthcare clinics at multiple Bexar and Wilson County locations. 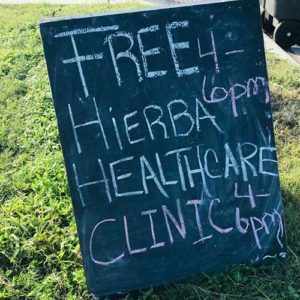 These clinics will be an opportunity for the uninsured, under-insured, and under-served to receive free competent integrative botanical healthcare and be connected to vital allopathic and alternative healthcare resources. Whenever possible, traditional (Indigenous) healers, doulas, bodyworkers, mental health care providers, and allopathic healers will be available for clients to consult at the clinic. Time: 3pm-7pm, sign up to be seen begins at 2:30pm and last sign up to be seen accepted at 7:45pm. We feel strongly that healthcare is a human right, do you? Help Yanawana Herbolarios bring quality, compassionate healthcare to those who need it by donating today.